The University Women of Europe (UWE) annual conference took place in Bucharest, Romania, 4-7 September 2014. The INGO Dialogue Teaser Workshop was part of the plenary programme. A very motivated UWE audience of over 70 listened to a presentation of the Dialogue Toolkit, divided up into groups and worked through three sets of questions and shared with each other their essential findings; that much for a quick immersion into the INGO Dialogue method. UWE President Drs. E.J.W. Lommerse wrote afterwards: “We all realized there is still much for us to learn and work on but we are all inspired to follow that path you set out for us. We aim to contribute to a better dialogue in our home countries… a vital step in the further development of the associations and their work for women and girls throughout Europe. “ The Embassy of the Netherlands in Bucharest welcomed UWE Delegates and the Dialogue Hub Coordinator for a Reception in the Ambassador’s Residence, one of the City’s stylish period mansions. UWE is a network of Associations of University Women from nineteen European countries and is a Member of the INGO Conference of the Council of Europe and as such has benefitted from preferential treatment to obtain delivery of the Teaser Workshop. 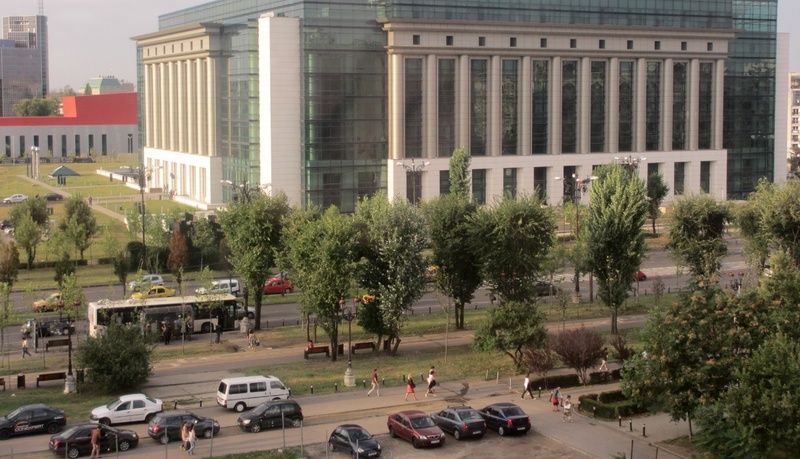 The Romanian National Library, site of the UWE Conference in Bucharest. The toolkit on Conducting Intercultural Dialogue is an excellent project that I totally support. I think that what\'s important is not so much to agree but to learn to live together in peace, respect and in a constructive way.